Dead Island Riptide is more of the same, offering minimal improvement, while suffering from some of the same issues that plagued its predecessor. However, with that being said, it's still quite fun. Two years ago, Polish developer Techland joined forces with Deep Silver, and presented the gaming community with one of the most talked-about video games of this generation: Dead Island. An interactive take on an unrealistic vacation from Hell scenario, the first-person shooter/action-RPG tasked players with surviving against hordes of undead foes, while attempting to escape a popular vacation island. It didn’t matter if you went at it alone, or with up to three friends, the experience consisted of lots of hacking and slashing, along with tons of fetching and a lot of travel. As such, that rather basic design formula and its resulting repetition led to polarizing opinions within the new intellectual property’s rather large group of consumers, many of whom had purchased the game based on its unforgettable promotional trailer. Although Dead Island captured my interest and wallet with its interesting premise, melding of great genres and exemplary marketing, it sat on my dresser for two years after I purchased it and became part of my rather large backlog. I hoped to get to it in a timely manner after putting my fifty dollars down on it, but just didn’t get around to playing it, choosing to focus on other games at the time. However, I never forgot about it, and made sure to complete it – something that I accomplished only several days ago. Having heard multiple reports about the quality of the game, all of which were mixed, I admittedly went into it with a bit of puzzlement and hope. Of course, the latter factor dealt with my fear of having wasted fifty dollars on something that I wouldn’t end up liking, which is a feeling that just about everyone out there can relate to in some fashion. Thankfully, though, that didn’t end up being the case, because, unlike a lot of people, I found Techland’s zombie hacker to be quite a bit of fun. Was it amazing? No. Actually, its general design was more basic than inspired, and it lacked a wow factor. However, with that being said, battling zombies while questing on Banoi’s sunny beaches ended up being an immersive and addicting experience. As a result, I feel that my money was well spent, even though I could have easily purchased the disc for twenty dollars by the time I ended up inserting it into a console. 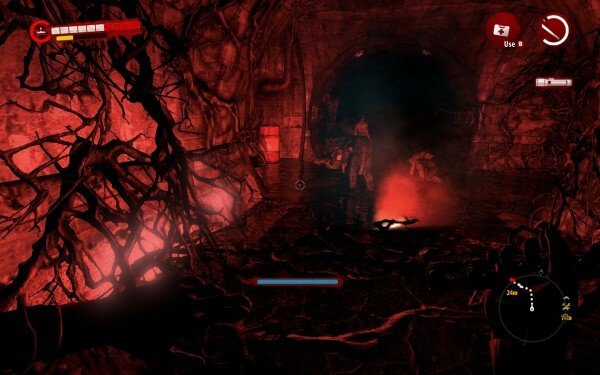 At the end of the aforementioned RPG, players’ efforts were rewarded with a final cutscene that showed the campaign’s immune heroes escaping from the island of flesh-eaters. Their helicopter took off and carried on without problems, leading us to believe that they’d made it out of danger for good. Unfortunately for them, though, that wasn’t the case, as a sequel dubbed Dead Island Riptide has now made us aware of what happened to said flight machine. Unsurprisingly, its outcome wasn’t a good one. Opening with a bladed descent towards a seemingly safe military ship, Riptide is quick at throwing its returning protagonists into yet another zombified conflict. It all starts with capture, which leads to experimentation and then catastrophe, as the water-bound vessel capsizes, sending its inhabitants into the surrounding blue abyss. Thankfully, one hit wonder Sam B. and his pals end up washing ashore on a neighbouring island, along with a new playable character whose kicks are much more powerful than any human’s should be. After being rescued from the sea by a young lady named Harlow, our survivors quickly learn that the infection they once thought was contained to Banoi is, in fact, alive and well on its neighbouring isle. That’s great news for those of us who find fun in decapitating the undead, but it’s the exact opposite of what the weary group had hoped to hear. Then again, it’s not like one can blame them after all they went through the first time around. Now, they’re forced to deal with the same issue on a foreign landmass, which is far less built up than its peer, not to mention less interesting. Thankfully, they can at least carry their stats over to this new adventure. Despite being a brand new, fifty-dollar retail release, Dead Island Riptide is little more than an expansion. Its developers were quick to mention that fact, and it’s a good thing that they were so candid about it, because there aren’t many differences to be found here. The gameplay is almost exactly the same, consisting of lots of hacking, slashing and fetching, with little else on offer. Not only that, but the storyline is treated as more of an afterthought than before, simply serving to give cause to the on-screen action. Simply put, those who’ve been hoping for notable improvements will be disappointed, because, while certain things have been slightly improved, other mechanics somehow decreased in quality over the last two years. Where Techland’s latest output succeeds is in its ability to offer more of the same fun gameplay that endeared its predecessor to some. Fighting the undead is more fun than it was before, thanks to improved weapons, a wider assortment of mods and a more powerful kick attack. For the most part, the combat’s improvements are undeterred, but not entirely. For some reason, the folks behind the brand decided to add in a couple of new mechanics, both of which left a lot to be desired. First, there’s the new charge attack, which trades stamina for power but misses most of the time. 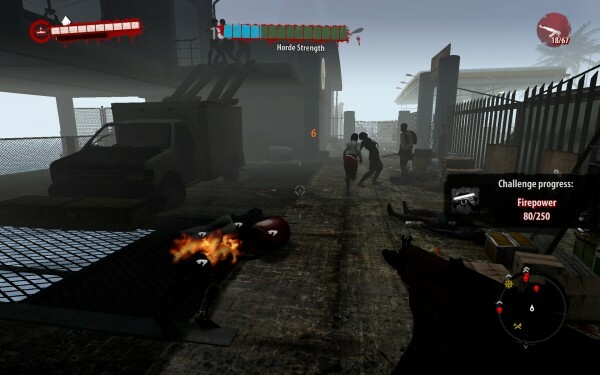 Then, there are several uninspired action-defence segments that bring to mind Call of Duty‘s Zombies mode. Poor implementation plagues both of those new additions, and they end up taking more away from the game than they add. Slowing down the experience by forcing players to barricade themselves within, and protect small-scale locations, the action-defence segments make a bit of sense. 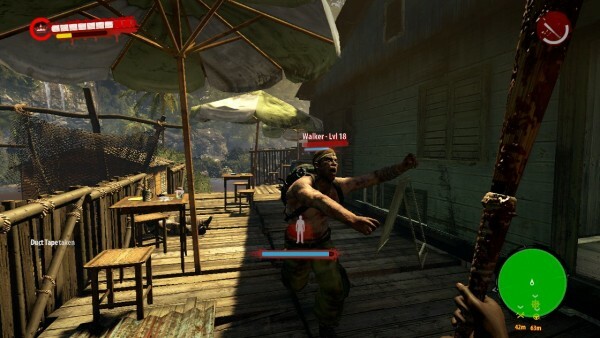 However, this is Dead Island – a franchise wherein the enemies level up in conjunction with the players, ratcheting up the challenge through artificial means. If that wasn’t the case, those sections of the game would have maybe been more fun, even though they’re hampered by a glitch that prevents fences from being put up unless you’re looking at their highlighted construction zones at certain angles. It is, though, and having to battle wave upon wave of dumb and overpowered foes ended up becoming a drag. It would’ve been nice if the fence issue was the only one that hampered my experience, but I’d be lying if I said that was true. The simple truth is that, much like its predecessor, Dead Island Riptide is somewhat buggy. While I never experienced any sort of game breaking bug, I did come across glitched items and animations. On top of that, the game’s sound actually cut out once, and didn’t come back until I quit back to the system’s dashboard. At that time, my thought was that it was caused by playing co-op with another player, but the problem didn’t recur when I completed the last act of the campaign with a couple of random folks. Amidst the above resides a rather robust and well-implemented co-op system, which is practically identical to what fans of the first game are accustomed to. Employing a system known as Near, and allowing players to connect with similarly leveled randoms at the click of a button, it’s probably the best part of what is a rather one note release. The mechanic and the surprisingly fun, but basic gameplay that it accentuates, make Techland’s follow-up enjoyable. Still, it must be said that the attached flaws are more difficult to look past this time around. Two years have passed and very few improvements have been made, which is tough to believe. Furthermore, the oft-referenced boats that are now available for use are stiff and boring to drive, the included presentation is as dated as what came before it, and framerate issues sometimes slow things down to a crawl. 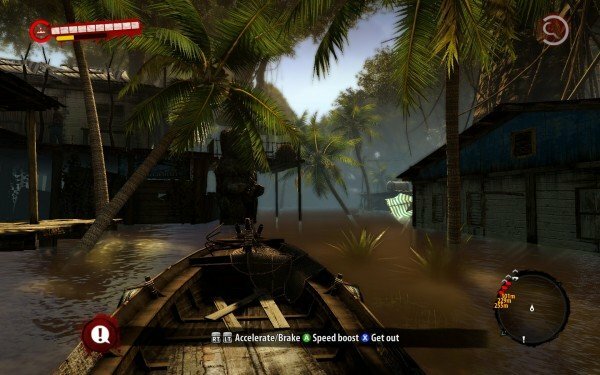 At its full, fifty-dollar price tag, Dead Island Riptide is a tough game to fully recommend to the everyday gamer. There’s quite a bit of fun to be had here, but there’s nothing new or revolutionary about this repetitive and uninspired package. Even though it’s an expansion of sorts, instead of a sequel, this release should show more improvement than it does, and would have benefitted from a more engaging location. Still, with that being said, those who found a lot of enjoyment within the first game will probably find some here. My advice is to simply wait for a price drop if you fall in that category, or stick with a rental if you’re new to these zombie-infested tropics. Those who never enjoyed Techland’s first take on the walking dead will not have their minds changed by its shorter follow-up.